The spanish property market is hampered by a confusing jumble of official house price figures and indices that do little to illuminate the state of the market. A new ‘House Price Index Tracker’ bringing together all the key figures – the first of its kind – prepared by Spanish Property Insight, should make it easier to see the bigger picture, and understand what is really going on with house prices in Spain. Some months the headlines proclaim that average spanish property prices are going both up and down, as was the case in June this year, when the Government’s Housing Department (in the Ministry of Public Works), the National Institute of Statistics (INE), and the Registrars all released figures showing rising house prices, whilst the General Council of Notaries, the appraisal company Tinsa, and property portals Idealista.com and Fotocasa.es relased figures showing falling house prices. Casual observers could be forgiven for thinking the average price of property in Spain is miraculously rising and falling at the same time. So reporting house price data from different sources in isolation is a problem. Readers need the bigger picture, which they will now get from the SPI House Price Index Tracker, including all the most important data going back to January 2014. To kick of the Spanish House Price Index Tracker let’s look at the latest figures, and then at the bigger picture (all illustrated in the chart above). The latest figures published come from the Government showing house prices up 1.2% over 12 months to the end of Q2 (up to 1,477 €/sqm) – the first time this house price index has risen on an annualised basis since Q3 2008, when boom was turning to bust. That means this is the first time this index has risen in 26 consecutive quarters, having bottomed out with a 10% decline in December 2012. House prices rose in 11 regions led by the Canaries (+4.1%), Madrid (+3.5%), Aragon (+3.5%), Extremadura (+2.9%), the Valencian Community (+1.5%), Catalonia and the Balearics (+1.4%). Prices fell in various regions including Murcia (-1.3%). On the basis of this index, spanish house prices look to be on a clearly upward path, though they are still down 29.7% from the peak in Q1 2008 (and down 36.6% in real terms). Last week the General Council of Notaries also released new figures showing house prices down by 2.4% in July, to 1,247 €/sqm. Seemingly the most volatile index , the notaries’ index has been heading down now for three consecutive months, suggesting that figures from the INE and Registrars, which lag the notaries by a few months, might soon follow suit. Other recent data includes the index from Tinsa – Spain’s leading appraisal company – showing house prices heading towards stability for the first time in years, down just 0.9% in August. The Tinda index has had its ups and downs in the last two years, but the trend is clearly upwards towards positive territory. 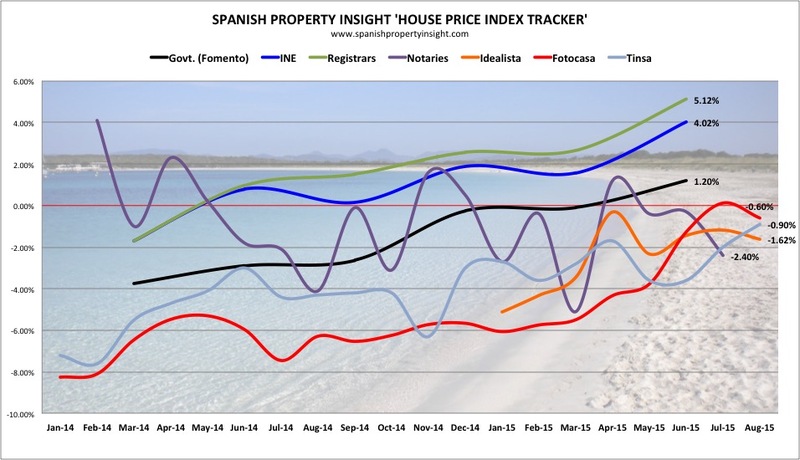 Turning to asking prices, the data from Spain’s two biggest property portals – Fotocasa and Idealista – show vendor expectations turning down in August, with both posting negative results, though the underlying trend still looks like it is upwards. August can sometimes be a strange month for data, so we will have to see what the next few months bring before drawing conclusions about asking prices. With the exception of the notaries’ figures – the most volatile of the lot – and the only source with a downward trendline over the period from January 2014, the rest of the indices from all the main sources show an upward trendline since the start of last year. So the bigger picture is one of prices in, or heading towards positive territory, with the exception of the notaries, who show prices turning down. The most obvious pattern is the similarity between the data from the Government, the INE, and the registrars, who all publish their data on a quarterly basis, which helps to offer a smoother curve. If you use only quarterly data (which means ignoring July and August), you get this picture, in which the upward trend is more pronounced. Were it not for the data from the notaries, and the fact that asking prices also turned down in the latest figures, it would be easy to claim that the overall house price trend is upwards. But because the notaries and property portals provide some of the freshest data, this may be a sign to expect news of a downturn in prices, and the recovery losing steam, in the next few months.